Pork is a summertime favorite and these pork recipes would be great for your 4th of July party. You’ll find everything from pork burgers and ribs to pulled pork. All recipes include the nutritional information to make your diabetic meal planning easy. Add extra cayenne pepper to this rub if you like your ribs smokin’ hot. Once the ribs are on the grill, lift lid once or twice and rearrange the ribs if some areas are becoming too dark. Recipe for Lone Star-Style Smokin’ Spicy Ribs from our Main Course recipe section. Bring the flavor of the Southwest to your grill. 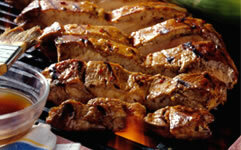 Recipe for Southwestern Grilled Pork Tenderloin from our Main Dishes recipe section.